Preheat oven to 350 degrees. When it’s hot, place pie pan with crust onto baking sheet, pour dried beans into the bottom of the crust and cook 10 minutes. Remove the pre-cooked crust and set it aside. When it’s cooled off, pour dried beans into a bowl and allow to cool so you can store them for another pie pre-cook. 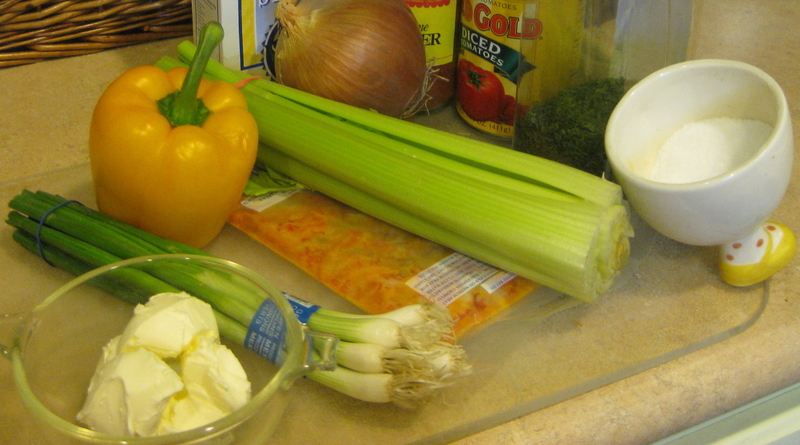 Add onions, bell pepper and celery. Cook, stirring, for another 6-8 minutes until vegetables are tender. 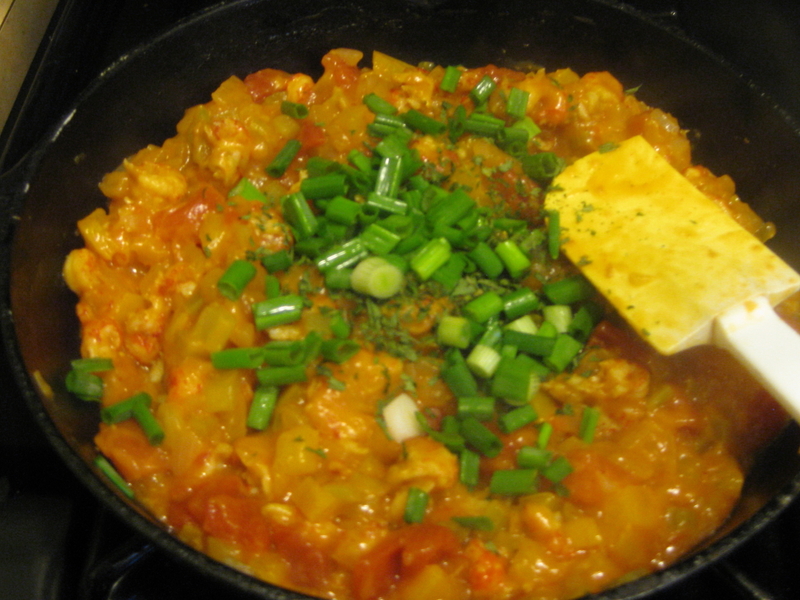 Add tomatoes, crawfish, green onions, parsley and seasonings. Cook another 2-3 minutes until just heated through. Pour into large bowl and let cool about 10 minutes, then pour filling into pie shell. Bake 40-45 minutes until crust is golden and filling is bubbling hot. Allow to cool 10-15 minutes before serving. Serves 6. Ooo. This would be tasty in phyllo. You always raise the standard when it comes to party apps. Karen, thanks for looking us up! 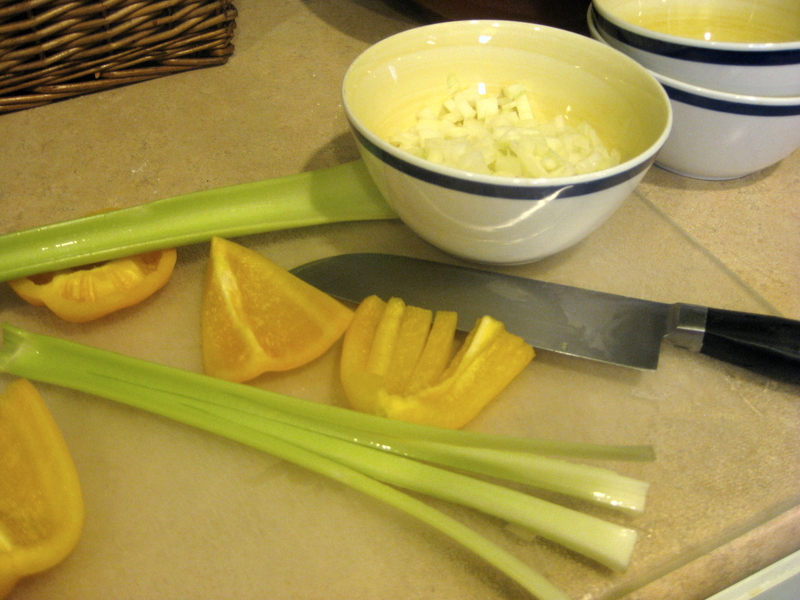 I’ve got lots of other really good, easy recipes on this blog. Highly recommend the Red Beans & Rice and the Creole Bread Pudding. Next week, Shrimp & Grits. Thanks for posting your recipe…your instructions are a bit misleading as it looks like you don’t actually cook the veggies in the roux, but in a separate pan with more butter. I made it as instructed (cooked the veggies in the roux) and it came out real dry – almost like stuffing – before making it into the crust. I think it definitely needs more liquid in there somewhere. Just a tip for anyone else who might try this recipe. Why are you using Chinese crawfish? Sadly, it was the only crawfish available at Patsy’s grocery store in north Mississippi when she was doing the recipe. Locally, we have plenty of Louisiana options that are far better. When Patsy is in town, she cooks with local seafood. 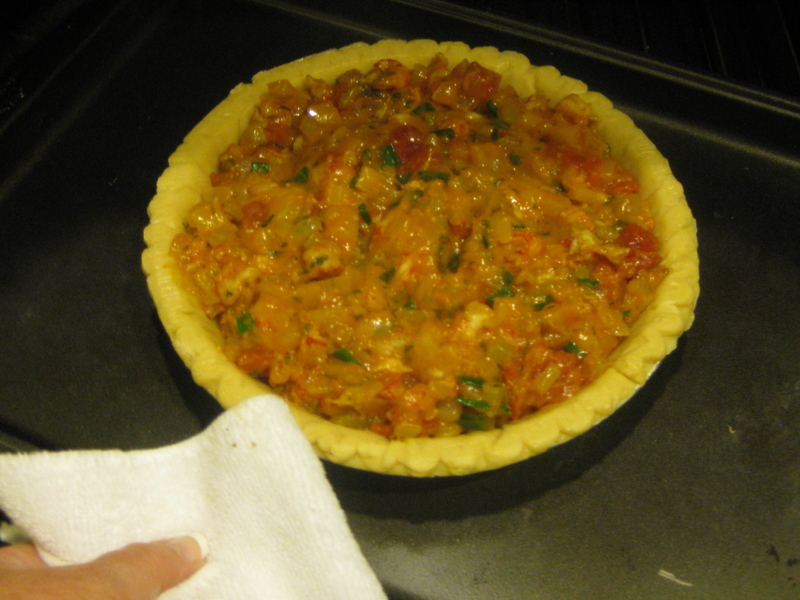 We’ll reshoot the photos with local crawfish the next time she makes crawfish pie. Extremely disappointed to see imported crawfish (Bernard’s) in your picture, when certified Cajun products of Louisiana are readily available. Shame on you. However, the recipe looks wonderful, but I’ll be making mine with Louisiana products. Gina – it was the only crawfish available at Patsy’s grocery store in north Mississippi when she was doing the recipe. You are correct about local seafood – we have plenty of Louisiana options that are far better. When Patsy is in town or Gulf seafood is available at her grocery store, she cooks with local seafood. 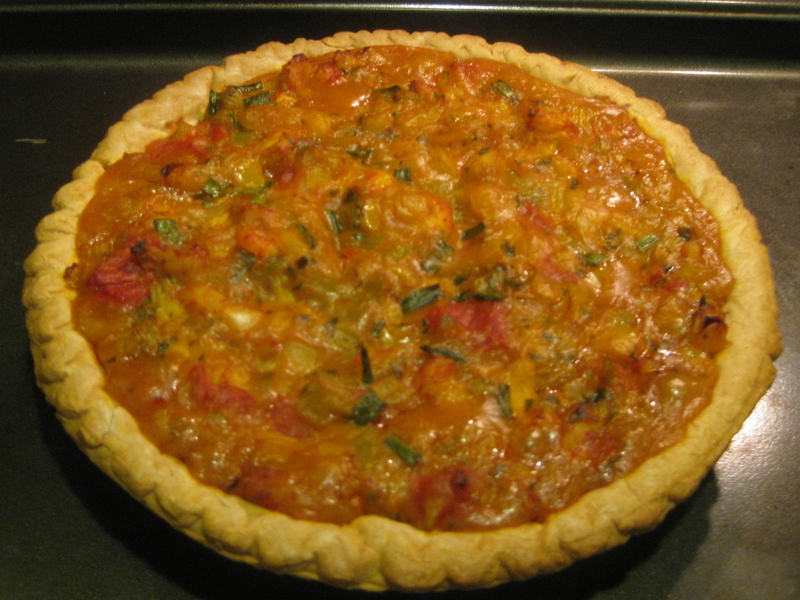 We’ll reshoot the photos with local crawfish the next time she makes crawfish pie. I’d have to agree with Kristi. I made this recipe last night as instructed and once I added the vegetables to the roux it came out extremely thick and pasty. I had to add milk to thin it out enough to cook the vegetables. 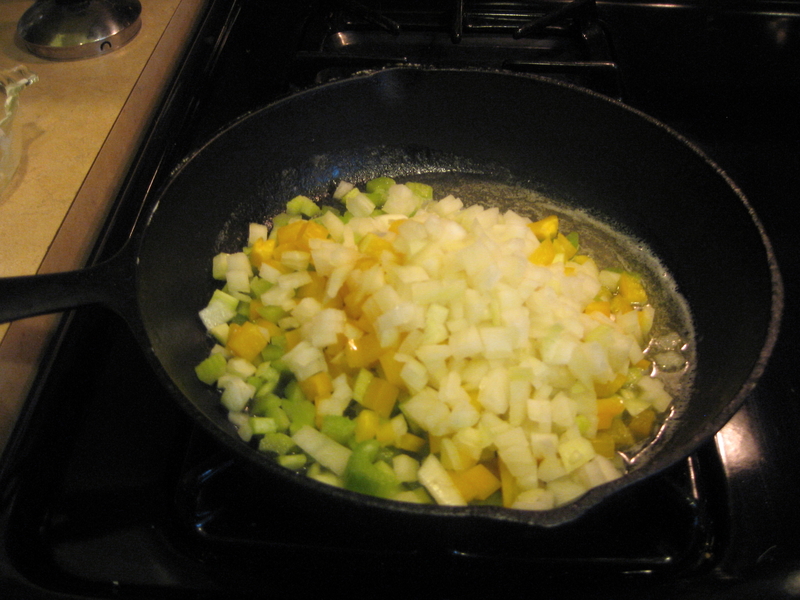 When looking back at your photos it looks like you didn’t cook the vegetables in the same pot as the roux. When did you add the roux to your crawfish and veggie mix? My friends served it at a dinner party and it disappeared. It also includes video instructions. Best of luck! Please let me know if y’all figure out a way to improve the recipe and I’ll get it updated. I too think something is missing from the recipe. Mine is dry, like stuffing. I wish I would have read the comments before making it this evening. Oh well. At least it’s got good flavor. That sounds delicious! Thanks for the recipe link, Jim! I live in Louisiana and everyone that I know that uses the frozen crawfish, after they thaw you place them in a strainer and wash them first and the water runs clear, and afterwards you season them with creole seasoning. That’s just a tip, it will taste better. I live in Louisiana and everyone that I know that uses the frozen crawfish, after they thaw you place them in a strainer and wash them first until the water runs clear, and afterwards you season them with creole seasoning. That’s just a tip, it will taste better. NOOOO. Not good Louisiana crawfish! You’ll wash the tasty fat off! I’m glad I read the earlier comments before I made this, because I was dubious about the lack of fluid. I checked some other recipes and did this: followed this recipe through cooking the vegetables in the roux for 8 minutes. Then I added a little over one cup of seafood broth (actually just shrimp shells and some leftover onions peppers celery and parsley cooked in water for 20 minutes or so). 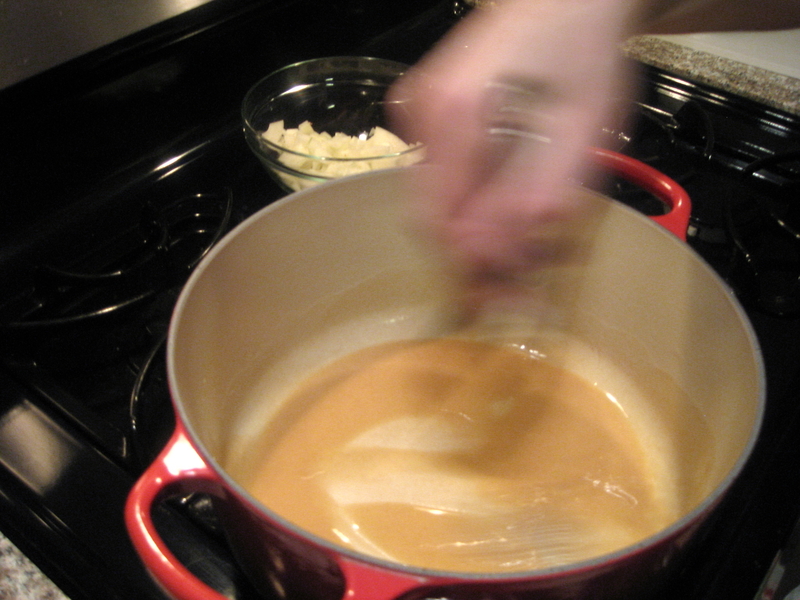 The roux thickened up quickly and looked a lot like the photos. A recipe from Emeril I found on line used a cup of water but half the butter and flour, so my filliung is thicker than that would be. If I did this again I think I would use less flour and butter (a half as in the Emeril recipe or perhaps 3/4s. and then a cup of fluid. Thanks for the feedback, Howard! Hope you enjoyed your pie.